New York, Jan. 26, 2018 – Tickets went on sale today for the much-anticipated debut of The Longines Masters of New York, which will ride into New York April 26-29, 2018. The unique four-day event will combine the world’s best indoor show jumping with a luxury lifestyle experience, offering spectators unparalleled first-class sport, live music, one-of-a-kind artwork, delectable cuisine, and more. One of the most prestigious international equestrian competitions, the Longines Masters Series spreads the glitz and glamour from its origin city of Paris around the world as it has expanded into three of the world’s most luxurious, bustling cities: Paris, Hong Kong, and now, New York. Throughout the weekend, over 50,000 fans are expected to visit NYCB Live, home of the Veterans Memorial Nassau Coliseum. Top-ranked athletes such as Olympic medalists McLain Ward, Lucy Davis, Laura Kraut, Beezie Madden, and world #1 Kent Farrington plan to join local New York equestrians Georgina Bloomberg, Brianne Goutal, Jessica Springsteen, Karen Polle, and more to showcase the speed, agility, and heart-pounding action of international show jumping. The first-ever Riders Masters Cup, which premiered at the Longines Masters of Paris in December 2017, will culminate with a final showdown between Team USA and Team Europe at the Longines Masters of New York, allowing local spectators to cheer on their favorite riders and show their American spirit. Team USA will look to even the score on their home soil in what is sure to be a storied match up! The Prestige Village gives guests an opportunity to explore the bustling paddock between competitions and get up close and personal with the best riders in the international show jumping world while they warmup minutes before entering the competition ring. Fans can experience autograph sessions, enjoy luxury shopping from international brand partners like Title Partner Longines, which will display the Official Watch of the event in its elegant boutique, and Hermes, dance to live music, taste fantastic cuisine and sip on champagne, participate in educational experiences and family friendly activities and much more…all while they mingle amongst the awe-inspiring, equestrian-themed artwork on display by Rita Dee and Lisa Cueman from Helmholz Fine Art and custom Longines Masters-inspired work by Spanish street artist El Nino. When the competition ends, the Longines Masters is just heating up with glittering after parties, live music and exclusive DJ sets! 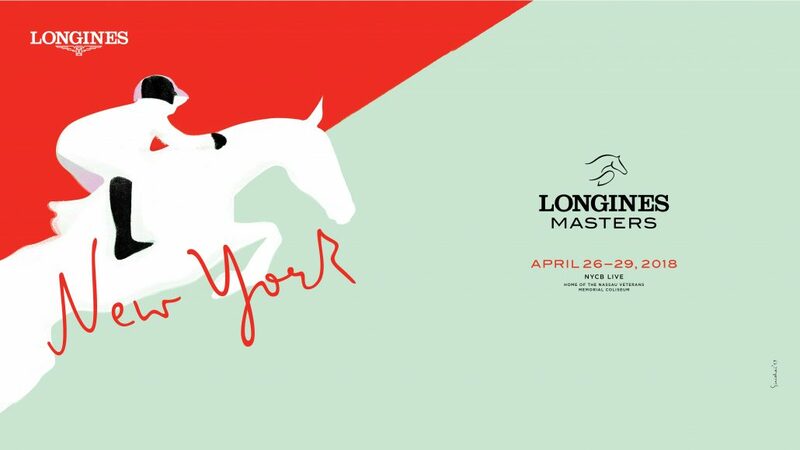 Whether you are enjoying the competition ringside from the prestigious Masters Club dining on menus curated by a celebrity chef or cheering from the grand stand with thousands of screaming fans, the Longines Masters of New York rides into town in April with something for everyone. Tickets for the 2018 Longines Masters of New York are available now on ticketmaster.com. For full information on the event, visit www.longinesmasters.com. Download the PDF of this post here.